Recent IWMW events have attracted participation from across the length and breadth of mainland UK. But not all institutions are represented at the event, the annual Institutional Web Management Workshop, which was established 21 years ago to support those with responsibilities for managing institutional web services and, in recent years, has extended its remit to cover digital services beyond web sites. This blog post introduces a survey which aims to address those who do not attend IWMW events in order to discover the reasons for this – the survey is available at the URL bit.ly/iwmw-attendee-survey . Surveying non-attendees at an event is clearly not easy – how do we find these people? We hope that IWMW attendees will be willing to share information about the survey – and to incentivise completion of the survey those who complete the form will be entered into a draw for a small gift. 19 plenary speakers; 15 workshop facilitators and 12 master class facilitators. A total of 42 individual speakers, facilitators or session chairs. 12 female (20%) speakers, facilitators or session chairs and 30 males (80%), including 6 female (32%) plenary speakers. 25 who currently work at a higher education institution; 4 who work for a higher education agency; 10 who work for a company and 3 who are individual consultants. Of the 14 plenary speakers who work at a university 10 are first-time speakers at the event, which includes 4 who are also first-time attendees at an IWMW event. there are only a limited number of speaking slots available at IWMW events, so we will not be able to provide too great a geographical diversity of speakers. 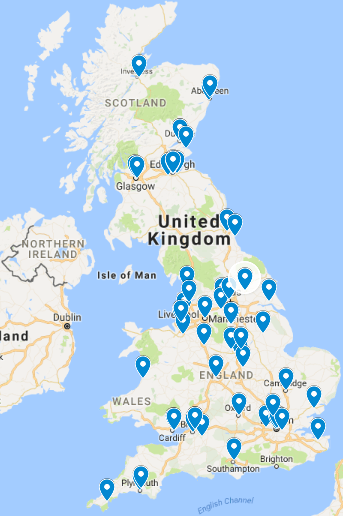 There are, of course, many more places for delegates at IWMW events and this is where we are seeking to ensure that members of web management teams across the community are aware of the event and willing to attend – and if they do not wish to attend we want to understand the reasons for this. This will be explored in a forthcoming blog post. This post looks at the host institutions for participants from the higher education sector at IWMW events in 2015, 2016 and 2017 (to date). Attendee data for IWMW 2015 and IWMW 2016 together with the current bookings for IWMW 2017 has been analysed in order to determine the location of the host institution for delegates who work at a higher education institution. It seems that so far delegates from about 60 institutions have attended events in recent years or will attend this year’s event. A Google Map of the locations is available and is illustrated. As can be seen participants from across England and Scotland have attended recent IWMW events, although there have been none from the two institutions in Northern Ireland and only two Welsh institutions are represented. The mission statement of the Midlands Innovation group is “Individually we are strong. Together we are stronger.” This could apply equally to many groups within the higher education sector – and particularly at a time in which the sector is facing many significant challenges (I am writing this post on the morning of the general election!(. In order to explore reasons for non-participation in IWMW events an online survey form has been created. The form also explores interests for other ways of community working such as regional groups (described by Duncan Ireland in a blog post on “The Life and Times of the Scottish Web Folk Regional Group“) and alternatives to IWMW events, such as commercial events. The survey is available at the URL bit.ly/iwmw-attendee-survey – feel free to share this URL with others.